I'm honored that you included my "Big Ol Mess" recipe to your collection. Thank you so much. A pleasure! Thanks for posting such wonderful recipes! 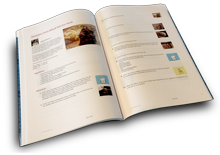 Thank you for including me in your wonderful cookbook. Thank you so much for adding my Breakfast Pizza recipe to your cook book! Always an honor to be included!